Father’s Day is right around the corner. How are you planning to spend the day celebrating your special dad? We hope you have a day full of fun, food and gifts! What dad could want anything more! If you’re still looking for the perfect gift, look no further. Here at Chefuniforms.com, we have all of your Father’s Day needs. Take a look at some fun gifts your dad is sure to love! A fun chef tee is a great gift for any dad. This “Weapons Of Choice” Attitude Chef T-Shirt focuses on the attitude and spirit of the everyday chef. Whether he likes to grill outside or stay in the kitchen, this shirt is perfect for any man who likes to cook. If you want to give dad the ego boost he deserves, you can’t go wrong with this “Chefs Rule The Kitchen” cotton tee. Your dad will feel appreciated every time he puts on his new shirt. Stylish and fun, dad can wear his new sporty tee at home while grilling or out for the day with the family. Don’t forget the matching hat! Make sure dad stays cool in the summer heat with this matching “Chefs Rule The Kitchen” chef hat. He can enjoy his favorite passion while watching the game at home or in the stands in this awesome baseball cap. See how great your dad will look in his new Chefuniforms.com chef tees and hat! It will be no risk to give dad a gift of comfort, love and fun! Happy Father’s Day! Give the Gift of Style for Mother’s Day! Happy Mother’s Day to all of the wonderful moms out there! Today is the official day to honor our mothers and do for them what they do for us every day. Today, we shower them with love and appreciation as we give them the day to sit back and relax. There is nothing mothers love more than special moments shared with family. We like to show our moms we care with gifts that will last a lifetime and help keep those special memories close to heart. Make this Mother’s Day one she’ll remember forever with this stylish kitchen apparel. Make sure your mom always looks dressed to impress in the kitchen with these great styles! Add some style to your mom’s daily routine with this fitted, lightweight chef coat that is the perfect blend of comfort and style. A mom’s best friend in the kitchen is her apron. Check out this traditional apron available in a wide variety of colors. Her new apron will ensure she is comfortable and protected while making great meals for the family! If you want to make sure your mom feels like the super mom that she is, you can’t go wrong with this chef t-shirt! Let everyone know she is not only wonder mom, but also a wonder chef in the kitchen! Your mom will shine like the star she is with some embroidery to her new coat or apron. Feel free to choose from our selection or create your own custom image or monogram to add some personal touches to her new kitchen gear. Get all these great items and more at Chefuniforms.com! With only a week until Christmas, many people are scrambling to find that one perfect gift for their special someone. Sometimes it can be difficult to find the right present that portrays how you feel. Luckily, you’ve got us to help! Here are a couple of ideas that should hit the nail on the head. 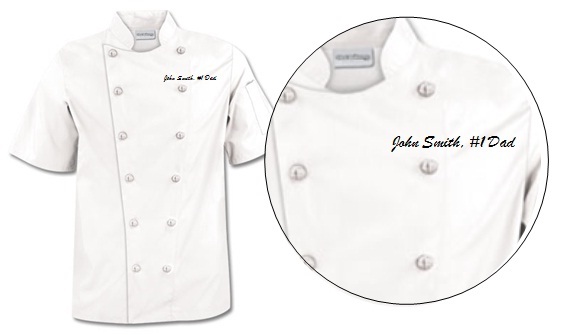 Whether or not your special someone is a chef, a new chef uniform would make a great gift for any loved one. Have you thought of embroidery? You can get them their very own one-of-a-kind chef coat! If it’s the thought that counts, this one is definitely a winner. Another idea for a gift is a pair of slip resistant chef shoes. You don’t have to be a chef to wear them, and there are a number of uses for these shoes, only one of which involves the kitchen. You can also wear slip-resistant shoes on a boat, in a hospital, on a running track, or anywhere else you can think of where you might be in danger of losing your footing. Of course, if your loved one is a chef, then what better way to say “I love you” and “I care about your well-being” than a good pair of don’t-slip-in-the-kitchen chef shoes? Worried about getting the wrong size or style? How about a gift card? Our ChefUniforms.com E-Gift Cards are always the perfect fit, no matter the occasion. With one of these, your friend or relative can shop till they drop, and they don’t even have to leave the house! I know you’re probably wondering how it can possibly get any easier to find the perfect gift. Well, wonder no more! If you spend over $99 before 12/22/13, you’ll also be able to enjoy Free Shipping on your purchase! Happy Shopping! Have any other ideas for a last minute gift? Leave it in the comments below! Father’s Day. The third Sunday in June, when families come together and honor that person they so affectionately call dad. And how do we honor our dads? Presents! It is a proven fact that dads love presents. But what do you get for the guy who has everything? Isn’t it obvious? No, not another tie. Get him a brand new chef uniform from ChefUniforms.com! You might say, “But Father’s Day is just 4 days away! How can I order something online and expect to receive it by Sunday?” Well, with ChefUniform.com’s Express or Overnight Delivery, you can be sure your gift reaches its destination on time. And hey, there’s always his birthday! Whether or not he’s a chef, a new chef uniform would make a great gift for any dad. You can embroider “#1 Dad”, “World’s Greatest Dad”, or even his name onto a new chef coat. Trust me, he’ll love the thought, and he’ll really love that he has one more thing that proves his greatness to all of the other dads in the neighborhood. Another idea for a gift is a pair of slip resistant chef shoes. You don’t have to be a chef to wear them, and there are a number of uses for these shoes, only one of which involves the kitchen. In addition to the obvious kitchen use, you can wear slip-resistant shoes o n a boat, in a hospital, on a running track, or anywhere else you can think of where you might be in danger of losing your footing. Of course, if your father is a chef, then what better way to say “I love you” and “I care about your well-being” than a good pair of don’t-slip-in-the-kitchen chef shoes? Start his day off right by bringing him breakfast in bed. Don’t forget the OJ! Cook him a big, juicy steak or burger, but add something new to the mix: find a recipe for an “ultimate burger”, or anything that is bacon-wrapped. Dads work hard all week; Fathers Day should be his day of rest and relaxation. Bring him his favorite beer and he’ll be your best friend. Take his favorite food and kick it up a notch. Deep-fry it or wrap it in bacon (again, bacon always gets a thumbs up), but whatever you do, don’t make it healthy! It’s his one day to eat like a king, so let him! His arteries won’t thank you, but his stomach and taste buds will. Take him to his favorite restaurant and surprise him with a meet and greet with the head chef, followed by a food tasting. If he loves food as much as we do, he’ll love every minute of it. And remember, if you are going to buy him a gift, as much as dads love wearing ties, there is a limit to the number of ties a man can own, so stop buying ties for father’s day and start thinking outside of the box! Visit ChefUniforms.com for more gift ideas for this coming Father’s Day.